On September 15, (Saturday), annual, autumn celebrations will be held at the Rock Shrine of Divine Mercy in Slovakia. On the top of Mount Butkov, there will be a solemn Mass at 3:30 pm, celebrated by Fr. Marek Hriadel. 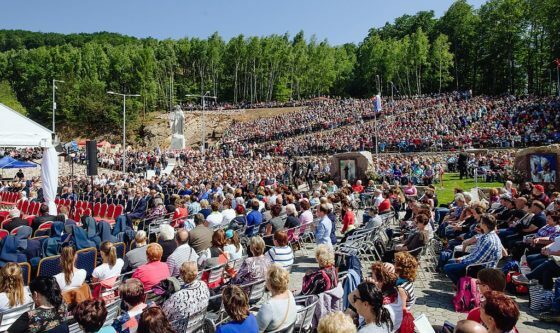 Some of the pilgrims will arrive at the foot of Mount Butkov at 12:50 pm to enter the place of the celebration (the 11th floor of the stone quarry) along the Way of the Cross situated on the slope of the mountain. At 3.00 pm, sisters of the Congregation of Our Lady of Mercy from Slovakia and from the convent at the Shrine of Divine Mercy in Krakow-Łagiewniki will lead prayer at the Hour of Mercy and the Chaplet of Divine Mercy. At 5.00 om, an oratory by Pavel Kršku directed by Pavel Smolik entitled “The Passion of our Lord Jesus Christ” will be performed. The ceremony at the top Butkov is attended each year by pilgrims from all over Slovakia, Poland, Czech Republic and other countries.